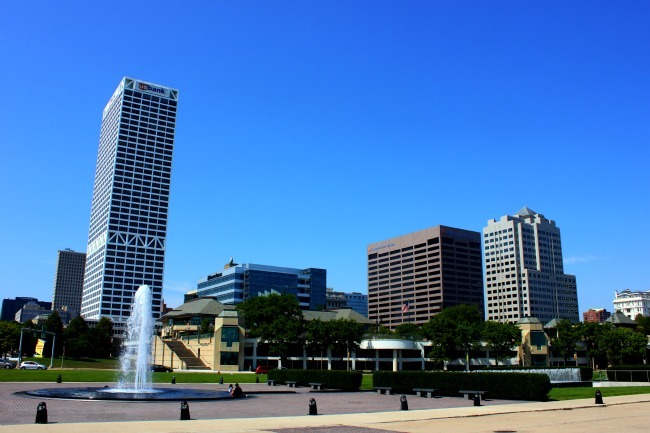 I had never been to Milwaukee, Wisconsin. Many years ago I drove through the city on my way to Minneapolis, but all I remember is the large baseball stadium I could see from the freeway. And on this trip, I wasn’t sure I would get to see the city, but lucky me, I did get a quick tour of the downtown, before heading north out of the city. I was impressed to see the shoreline of Lake Michigan, not surrounded at that point by condominium developments but by park and plenty of paths, easily accessible by people walking, running or cycling. And my eyes fixated on the elegant creation of the Milwaukee Museum of Art, a bold white building created by architect Santiago Calatrava. Designed like a bird, the building looked like it would take off above Lake Michigan. As I gazed up at the skyline – I was impressed with the brightness and boldness of the city – it didn’t seem like a place built on German traditions and beer – or did it? As my car guided me through the streets, the quick peeks at late 19th and early 20th century buildings gave me that European influence. It was a city that beckoned, with its endless green parks and unique architecture – I wanted to see more. As I spotted the newer architecture, the bold modernist financial buildings, I knew it was a city that had progressed and proud to show off – especially as the home to American icon Harley Davidson. But alas my time was short, so I fixated on taking some photos, absorbing my brief taste and putting it into the back of my mind that I will return.